Laminine Omega is a supplement partner for Laminine. It helps improve signaling throughout the body for a more pliable arteries and blood vessels, increased agility, balanced cholesterol levels using a formula that has extended release and long-term effect. Using Laminine as the base formula, the company introduces LifePharm OMEGA+++. Combined with Laminine (Fertilized Avian Egg Extract), Laminine OMEGA+++ targets these symptoms by focusing on the epicenter of our bodies -the area whose strength is essential for us to feel and look healthy. It improves our heart’s circulatory system. You can take Laminine Omega+++ 1-2 capsules per day, ideally 30 minutes before your first meal of the day. LifePharm’s Laminine OMEGA+++ is unique in its use of only the highest quality sources for Omega Fatty Acids 3 (EPA and DHA), 6, 9, CoQ10 Extended Release, Vitamin K2, along with an added boost of the Fertilized Avian Egg Extract, and combines them into one supplement. Watch Laminine Omega Plus video and how it can help your heart and bones, and provide 24-hour antioxidant. 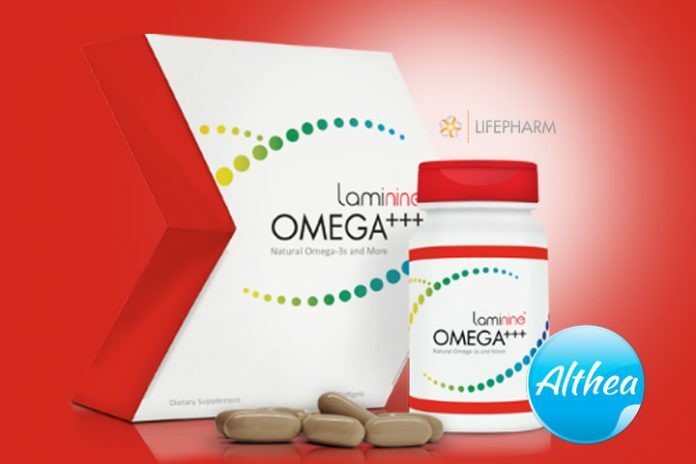 What is the difference between Laminine & Laminine Omega+++? Laminine OMEGA+++ is a potent supplement that targets your heart circulation, also an anti-oxidant, anti-inflammatory, & directs calcium to bones & teeth instead of calcifying elsewhere. There are 3 important ingredients added. Laminine (Original) is the best Omega partner for homeostasis. It promotes faster cell repair, restoration, or rejuvenation. Laminine OMEGA+++ does not contain all the 22 amino acids that Laminine (Original) has. Laminine (Original) is more potent when it comes to FGF extract. Is Laminine Omega for you? If you experience heart or chest discomfort, occasional coughing or wheezing, tires easily – Laminine OMEGA+++ is for you. With these symptoms, you may have the beginnings or onset of heart circulatory problems. It can only get worse as we age and depending on your genetic makeup, eating habit and activities. Laminine OMEGA+++ also help address the loss of appetite and queasiness. Best of all, Laminine Omega+++ combined with both Laminine and other ingredients that help the heart – you can experience quicker recovery after an exercise or physical activity. 5. Fertilized Avian Egg Extract. Help maintain normal levels of HDL (“good” cholesterol) and LDL (“bad” cholesterol), which keeps excess cholesterol from the building and triggers the brain to send proper signals to the circulatory system. A powerful antioxidant that helps fight oxidative stress in the blood vessels, leaving them clear for proper blood flow. ER stands for Extended Release, which means you can be protected up to 24 hours from free radicals. It helps to direct calcium to the bones and teeth, where it belongs, keeping the calcium from attaching itself to the arteries. It stimulates stem cells, allowing each of the other ingredients in Laminine OMEGA+++ to perform their function effectively. The primary role of Laminine OMEGA+++ clears the body’s internal pathways to optimize circulatory health. “My husband and I started taking Laminine in June 2013 and then Laminine OMEGA+++ in December 2013. Now he sleeps very well and his mood has improved. I feel very happy and have less stress in my life. Each day we feel better and younger (we are in our 60s). I’m so happy we have these products and I continue to share with friends and relatives the opportunity to have excellent health and wealth.” – Tatyana S., U.S.A.
“I’d been taking Laminine OMEGA+++ for a month and decided to check on the status of my cardiovascular and circulatory system. All tests came back with positive results—the ‘age’ of my vascular system came back as 48 when in fact I’m 64! I was really stunned and delighted!” – Galina A., U.S.A.
“Since taking Laminine OMEGA+++, I’ve experienced a noticeable improvement in my health! Taking it with Laminine, I have improved focus and energy.” – Lacie M., U.S.A.
“I have about 15 years of experience with dietary supplements, but the results I have seen with Laminine are the fastest and the most significant. My 73-year-old father and my children have all benefited from both Laminine and Laminine OMEGA+++. My father feels a difference in his stamina and circulation, and my children are better able to retain what they learn at school.” – Timur S., U.S.A.
Know more about Laminine Omega’s powerful natural food ingredients. Laminine Omega+++ supplement has been on the market since 2013. The benefits of taking it have been documented to which test results show it can help a person with certain health problems. However, there are fewer testimonials available online, compared to its predecessor - Laminine. While it does not negate its potency, clinical studies do show it has positive effects. I have a swallowing problem, was hoping you can tell me if i could chew laminine omega +++. We wouldn’t really recommend it. What you can do is to slice it open and mix content with honey. For bone health, do you recommend to separately take additional calcium and vitamin D because those 2 items are not included in Laminine Omega +++ ? Calcium supplement is recommended for those who may have osteoporosis or is aging. Calcium should be taken with Vitamin D. Food supplements and vitamins have different categories. It is normally recommended for someone aging to take calcium plus Vitamin D (or you can buy calcium with vitamin in 1). Then food supplement like Laminine Omega is added (which is basically a protein vitamin blend that works synergistically with calcium). Omega does contain and is not a calcium supplement, so it will be advisable to take both. You can take calcium (with Vitamin D), at the right amount. It is NOT advisable to overdose on calcium supplement likewise Laminine Omega should only be taken 1-2 capsule per day. You didn’t mention precisely the right amount of calcium and vitamin D to supplement Laminine Omega. My uncle has irritabe bowel syndrome. At the other page, Althea suggests to take 2 capsules of Laminine Original in the morning and 2 capsules at bedtime + 1 capsule of Digestive Plus for his IBS. Since he also has osteoporosis, I bought 3 boxes of Laminine Omega this morning. So what is the right doses for his ibs and osteoporosis altogether? Here in Indonesia we have a product called Calcium D Redoxon which contains 250 mg of Calcium (in the form of 625mg Calcium Carbonate), 1000mg Vit.C, 300IU Vit D and 15mg Vit B6. Is it good to supplement with Laminine Omega? Or 1000mg Vit.C is regarded too high? You can take any brand of calcium with Vitamin D (combined). The recommended dosage depends on the brand your choosing, but it’s usually once a day or every other day. Laminine Omega is only maximum of 2 capsules per day (together with meal, anytime). You should add the Laminine (original) following the recommended dosage of 2 caps/am and 2/caps/bedtime. Any calcium with Vitamin C is OK. For Vitamin C, you can take Immune+++ or take any generic Vit C at 500mg/day. For IBS, we recommend Laminine (original) + 1 capsule Digestive+++. Laminine OMEGA is only added if the patient has high cholesterol and osteoporosis. Can i take both Laminine and Laminine Omega? Wouldnt i be overdoing it? If you are having cholesterol problems, past the age of 40 and may need a bone supplement, you can add Omega Plus with Laminine. This is combination is highly recommended to those who have heart, bones, and aging organ issues. Is this available in Seoul? Yes Laminine is available no Seoul Korea. can laminine shrink uterine fibroids? Laminine (original formula) is known to shrink certain types of tumors. Unfortunately, we do not have a direct testimony on Uterine fibroids.